Police who trailed Scott Peterson after his wife disappeared testified Wednesday that he repeatedly drove to the bay where her body was found months later and at times appeared to try to shake the police on his tail. Prosecutors claim Peterson was so worried his wife's body would surface in San Francisco Bay that he visited the area several times during the search. Defense lawyers say he was simply checking on search efforts. Prosecutors called numerous police witnesses who tailed Peterson in the weeks after his pregnant wife, Laci, was reported missing on Dec. 24, 2002. The witnesses described how Peterson visited the Berkley Marina three times — on Jan. 5, Jan. 6 and Jan. 9 — as police scoured the bay for Laci's body. Witnesses noted that Peterson drove at speeds approaching 90 mph, at times in rental cars. "It was kind of a cat-and-mouse type thing," said Alexander Bettis, an undercover officer with the Modesto Police Department. He said at one point it appeared that Peterson knew he was being followed and drove erratically into the city of Berkeley. But on cross-examination of another prosecution witness, defense lawyer Mark Geragos noted that Peterson also visited a reservoir miles away from the marina after learning from a newspaper article that police were considering a search for Laci there. Jeff Mackanin, a state Department of Justice investigator assigned to follow Peterson at times, said he had no knowledge of that. Geragos was implying Peterson was simply going everywhere police were searching for his wife's body in hopes of finding some clues. Prosecutors allege Peterson killed his wife in their Modesto home on or around that Christmas Eve, then drove to San Francisco Bay, launched his boat from the Berkeley Marina and dumped her body. Her remains and those of the couple's fetus washed ashore in April 2003, not far from where Peterson set out for what he claims was a solo fishing trip the day Laci vanished. Defense lawyers contend someone else abducted and killed Laci, then framed their client after learning his widely publicized alibi. On cross-examination, Geragos highlighted the fact that Peterson began every day at the volunteer center and spent much time putting up fliers in search of his wife. Geragos also noted that Peterson's speed during trips to Berkeley was not unusual. "Certainly, it's not unusual to drive 80 miles an hour on the freeway, is it?" Geragos asked. Earlier Wednesday, a search dog handler who provided key evidence against Scott Peterson acknowledged on cross-examination that her canine had failed a videotaped training exercise. Eloise Anderson had testified that her dog, a Labrador named Trimble, picked up Laci's scent on Dec. 28, 2002, at a Berkeley Marina pylon at the water's edge. Geragos played for jurors a video of the training exercise that Trimble failed. 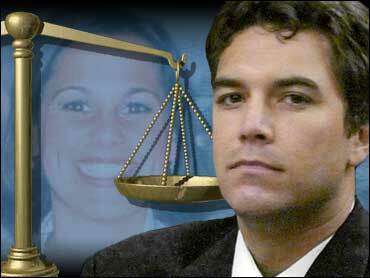 He then criticized the search at the marina, noting that Anderson never performed a "missing member test," in which Scott Peterson would have been brought to the marina for the dog to smell before searching for Laci's scent. Such an exercise, Geragos noted, could have helped rule out the possibility the dog was smelling Scott Peterson and not his wife. Anderson said a missing member test was not necessary.